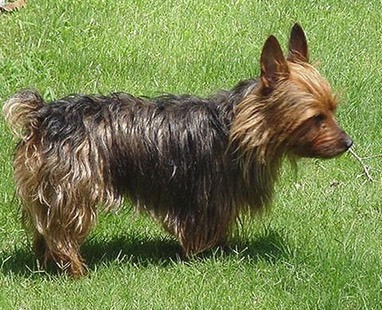 Taz was a Blue & Tan Australian Terrier. Taz loved to play and snuggle. As a puppy, his favorite toys included a stuffed crocodile that squeaks, nubby plastic footballs, and squeaky rubber basketballs. As an adult dog, Taz graduated to full size footballs, but he still loved those squeaky rubber basketballs. Taz enjoyed chewing on rawhide strips and animal hooves. Taz was also a very efficient bug finder and killer. House flies and spiders had a very short life expectancy at the Schuster house. Taz developed into a lovely lapdog. He enjoyed sitting with his family (especially with Mom) on one of the La-Z-Boy chairs, at his family member's feet, on their lap, or on their chest. Unfortunately, the original stuffed crocodile succumbed to Taz's massive teeth, but Santa brought Taz a surprise for Christmas. His favorite toys became the squeaky rubber basketballs. Taz also loved to have his tummy rubbed. He often plopped onto the floor, turned on his back, and barked to signal that he was ready for his tummy rub. Taz's world included a lovely backyard. Taz had free run of the fenced backyard and was able enter and exit at his leisure through a doggy door. Check out Taz's Outdoor World. A bird lived in our back yard. Taz wanted to get the bird. But Taz was small and the bird lived high up in the tree. Being an Australian Terrier, Taz didn't realize that he was so small. He thought he could get the bird. And he tried, and tried, and tried... Click and check out Taz versus The Bird. As part of his training routine, Taz sometimes challenged Garfield to a fight to the finish. While Taz's family doesn't normally support fights between cats and dogs, Taz insisted that he needed this training in order to eventually defeat the bird. Taz loved to chase and pop nontoxic children's bubbles. Click and watch the Bubble Ballet. As a puppy, Taz graduated from Puppy Kindergarten where he socialized with other dogs and learned some basic obedience commands. Taz was easily house trained (mostly) and sat near the door when he wanted to go out. If we were not paying attention, a sharp bark told us he wanted to go out. Eventually, he got to go in and out as he pleased through the doggy door. He knew sit, down, stay (for very short periods), come (when it suited him), and leave it (unless there is a bug in his mouth). Taz became a well socialized dog who loved people and was very gentle, unless you came through the front door. Click on Welcome To My Home. He (mostly) obeyed the basic commands and did not get into trouble (very often). Taz suffered a bit from separation anxiety. 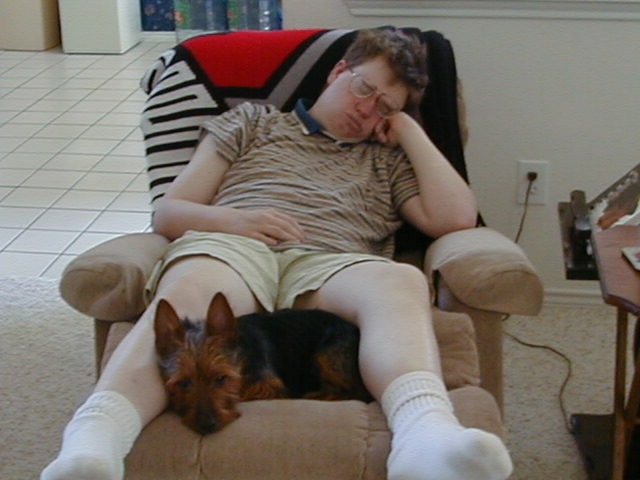 Fortunately, one of his brothers lived at home and stayed with Taz during the daytime when Mom and Dad were at work. During his first year, Taz regularly got refresher training from his family and he periodically got refresher training with a professional dog trainer. Actually it was Taz's family that got most of the training from the professional dog trainer. After Taz was a well socialized family pet, you might think that training was no longer needed. But to keep up his skills, we still periodically gave Taz refresher training on the basics. Taz had many wonderful friends and acquaintances. Check out Taz's Friends! Click hereTaz’s original webpage to go to .